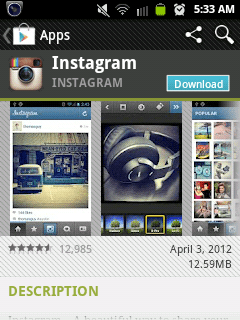 Earlier this morning while updating some of my apps on my Galaxy Y, I stumbled upon a blog post about Instagram for Android. I instantly downloaded it thru Google Play. It’s one of the best photo sharing app that became well known on Apple. Instagram is a fast, and a fun way to share your photos with friends and family. All you have to do is to snap a picture, choose a wide variety of filters to transform its look and feel, then post it to Instagram. You can share your favorite photos to Facebook, Twitter, Foursquare and Tumblr. It’s a reinvention of photo sharing ever. 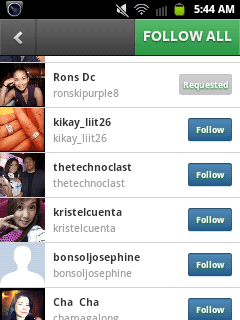 Now, the saddest part: I can’t view my pictures on my Samsung Galaxy Y while posting it to Instagram. It’s totally black out when I posted it. 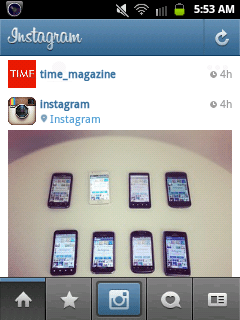 Not all Android phones can access Instagram. Few glitches like “The photo is small”, and experiencing black out on recent posting of photos. Oh well…I have to wait for their latest update.